The reported gruesome murder of a well-known, respected Saudi journalist while visiting Saudi Arabia’s consulate in Istanbul has sent shockwaves through Western media outlets. The macabre case not only underscores the despotic nature of the Saudi regime. It also shatters illusions about the oil kingdom’s youthful ruling Crown Prince whom Western media had been lionizing as a “reformer”. Last week, Jamal Khashoggi entered the Saudi consulate on Tuesday, October 2, in Turkey by appointment, in order to obtain an official document related to a planned marriage. It was around 1pm. His fiancée was waiting outside for him. But he never emerged. Four hours later, his worried fiancée phoned Turkish authorities, which Khashoggi had earlier advised her to do, concerned that he may be detained by the Saudi authorities inside the consulate building. Khashoggi is a high-profile commentator for the Washington Post and BBC among other outlets. His apparent disappearance made international headlines last week. Saudi authorities disclaimed any malicious involvement, insisting that Khashoggi left the consulate. Strangely though, Saudi Arabia’s Crown Prince Mohammed bin Salman, the kingdom’s de facto ruler in place of his aging father, entered the public fray by telling the Bloomberg news agency that the disappearance of the journalist was not the responsibility of his state’s officials. It seems strange indeed that the Crown Prince felt obliged to make any public comment on the matter. Four days later, however, the vanishing act took a shocking twist. It is now being reported that Khashoggi was murdered inside the Saudi consulate by a death squad dispatched from Saudi Arabia for the assassination. Even more gruesome are reports from Turkish police sources that the 15-member murder squad tortured their captive and dismembered his corpse, presumably to transport his remains discreetly from the premises under diplomatic immunity. The Saudi authorities are still maintaining their innocence in the matter, reiterating the claim that Khashoggi left the consulate building the same day he arrived on October 2. But that version of events is flatly contradicted by Khashoggi’s fiancée. Furthermore, the consulate building is dotted with CCTV security cameras, yet the Saudis have refused to release footage that might show the journalist walking away from the premises. Turkish police have reportedly opened a criminal investigation on the assumption that foul play occurred inside the Saudi compound. As noted earlier, unconfirmed Turkish police sources believe Khashoggi was brutally murdered by Saudi agents. 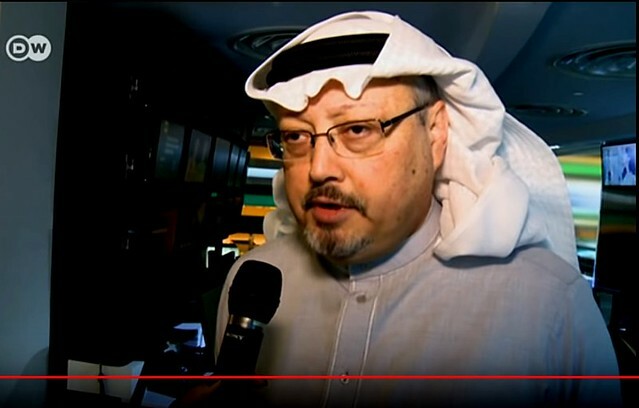 What is particularly shocking about the alleged killing is that Jamal Khashoggi is internationally known as a respected journalist. Since the ascent to power last year in Saudi Arabia by Crown Prince Mohammed, Khashoggi had become increasingly critical of what he saw as a wayward autocrat. His criticism was all the more damaging because Khashoggi was formerly viewed as an insider to the House of Saud’s royal court. He once served as a media advisor to Prince Turki al Faisal, a former ambassador to the United States and Britain. Khashoggi went into self-imposed exile in September 2017 when Crown Prince Mohammed launched a sweeping purge against other senior members of the House of Saud. Among the hundreds arrested and reportedly tortured while in detention was multi-billionaire investor and media magnate Prince Alwaleed bin Talal, who had appointed Khashoggi as editor-in-chief of his Arab News organization. While in exile, Khashoggi began writing ever-more critical articles about the de facto putsch under Crown Prince Mohammed. He had regular columns published by the Washington Post in which he highlighted the disastrous Saudi-led war in Yemen, and the futile blockade on Persian Gulf neighboring state Qatar. He also alerted that the allure of “reforms” under the Crown Prince was more illusionary than real. Significantly, the journalist was giving a very different perspective on changes taking place in Saudi Arabia compared with the generally positive coverage given by Western media, including the Washington Post. Since becoming the power behind the throne, Western news media have tended to lionize 33-year-old Crown Prince Mohammed as a “reformer”. His crackdown on opponents was portrayed as a long-overdue purge against corruption and cronyism, instead of the more realistic explanation of “long knives” to consolidate his own power. Despite the critical columns from Khashoggi, the Washington Post, New York Times, BBC and others have sought to project the young ruler as a refreshing departure from the “old, conservative” image of the Saudi monarchy. The Crown Prince has been embraced by US President Donald Trump, as well as France’s President Emmanuel Macron. His royal decrees to end a Saudi ban on women driving cars in the fundamentalist Wahhabi kingdom, and his opening of cinema theaters have been hailed as examples of how the Crown Prince was trying to “modernize” the country. One suspects that the real appeal for Trump, Macron, Britain’s May and Canada’s Trudeau was the Saudi ruler’s voracious spending on new arms contracts to fuel his war in Yemen. Nevertheless, more astute critics viewed the “reforms” as mere public relation tokens. While minor changes were being implemented, the Saudi regime was stepping up brutal repression against its Shia minority in Saudi’s eastern province, as well as continuing its slaughter and genocidal blockade of Yemen. The regime was also continuing to arrest women and other human rights activists. Some of those women arrested, such as Israa al Ghamgham, are now awaiting execution by decapitation. To his credit, Khashoggi was “raising his voice”, as he put it, for those who have no voice and are being slung into prisons and torture centers in Saudi Arabia. In doing so, the 59-year-old journalist knew he was putting himself at risk. He reportedly refused to return to Saudi Arabia despite entreaties from the House of Saudi and “guarantees” of his safety. That would explain why Khashoggi went to the Saudi consulate in Istanbul to obtain the divorce papers necessary for his planned new marriage. He went to the consulate on September 28, and was told to return to the premises on October 2 to collect the documents. That appears to have afforded the Saudi rulers enough time to prepare the fatal trap. A 15-member death squad was reportedly organized to intercept Khashoggi on October 2. It is a grim sign of the times when high-profile journalists are not even safe when visiting consulate buildings. It is also a grim sign of how much contempt for international law the current Saudi rulers have. Crown Prince Mohammed no doubt feels he has a certain immunity to do whatever his despotic whim desires owing to the fawning indulgence of Western leaders like Presidents Trump and Macron. That sense of immunity and impunity has also been fostered by Western news media, which have turned a blind eye to Saudi crimes, while presenting the absurd illusion of a reforming “prince charming”. Well, now the same sycophantic Western news media are in shock because one of their own contributors, Jamal Khashoggi, appears to have been brutally murdered on the orders of the “reforming” House of Saud. It’s a rude, blood-curdling wake-up. Western media lies about Saudi Arabia have not just been shattered. Those lies make them complicit in the latest Saudi crime, as they also have been complicit in so many others before, because of the way the Western media have emboldened the despotic Saudi regime to act in whatever despicable way it wants. Turkish authorities have suggested that a missing Saudi journalist was murdered by a special hit squad inside Saudi Arabia’s consulate in Istanbul. The prominent commentator was last seen entering the diplomatic mission. This entry was posted in Crime and or Corruption, Imperialism, Journalists, Media, Politics, Saudi Arabia, Turkey and tagged Assassination, Finian Cunningham, Jamal Khashoggi, Mohammed bin Salman, Yemen. Bookmark the permalink.